There are two basic types of Alchemy: The Laboratory Alchemy involving actual chemical experiments in the lab which may lead to creating the Philosophers Stone; and the Psychological Alchemy which may lead to the achievement of a higher conscious state in the individual human being. 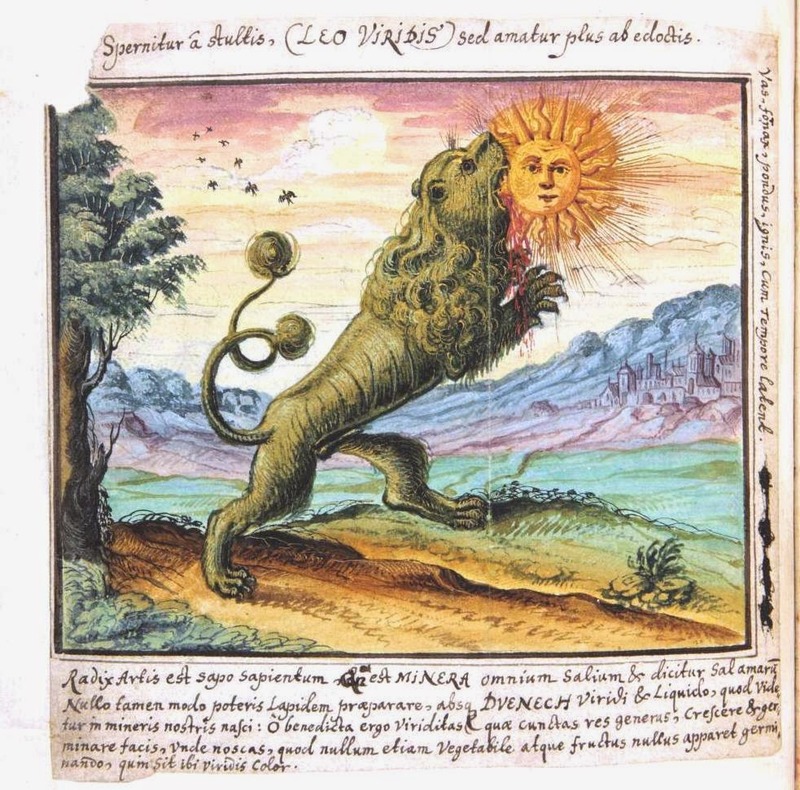 ‘The Green Lion Devouring The Sun' is a popular alchemical symbol. On a chemical level this is a metaphor for when a green, liquid sulfate called “vitriol” purifies matter, leaving behind the gold within the matter. Very pure vitriol is an acid that eats through practically anything, except gold. To naturalist alchemists, the Green Lyon metaphor described the process whereby plants used the rays of the sun to facilitate their own growth - a process we call photosynthesis. 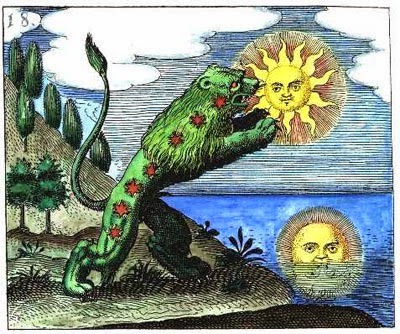 On a human level, the green lion eating the sun is a metaphor for when a person’s “consciousness [is] overwhelmed by violent, frustrated desires” (Fabricus). In other words, inside a person, when the metaphor of the green lion eating the sun takes place, the person is compelled to act out destructively. 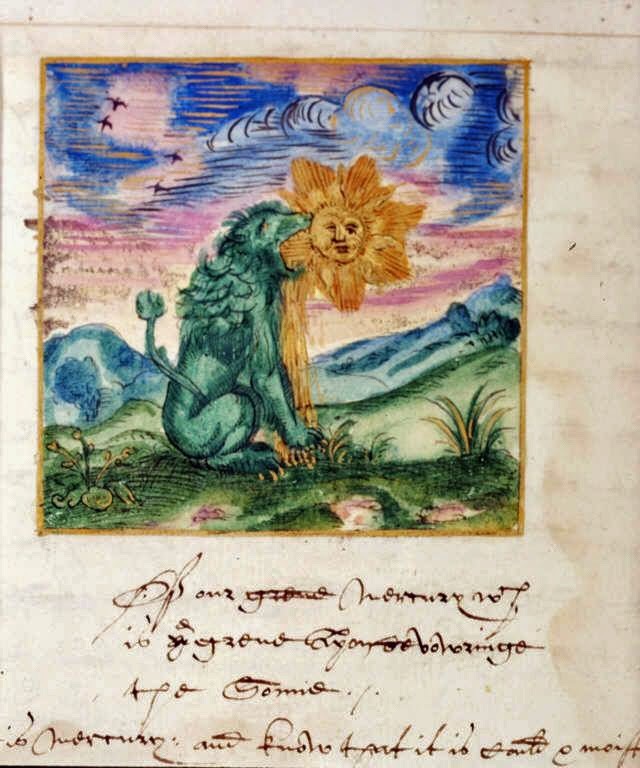 In contrast, when the green lion eats the sun in a person on a higher spiritual path (for example, an alchemist), the person allows the green lion to eat them in order to be purified — to become spiritually golden. Very helpful! This is an important image in the video game Virtue's Last Reward, and I was wondering what the symbolism meant. The consciousness thing makes sense within the context of the game - there's a virus in the game that causes the victim to experience information overload, prompting strong feelings of suicide. Green Lion = Cannabis. When cannabis is boiled down to a tincture, it looks like liquid gold with shiny gold flecks within it (gold tincture). The bud is always the tail of the lion, often 7 leaf shapes are seen around the beast. The devouring of the sun is cannabis' obvious feminising properties, which, when applied will open those 7 seals. Would it be foolish to equate the seven seals with the chakras? I have read multiple books on esoteric symbolism and I believe it was Blavatsky who spoke of the green lion, the aspirant - green because he is learning and because he must work from the heart which is represented as the 4th green chakra. The lion because to endeavor into the arts of occult knowledge, into Gods dimensions the aspirant must hold courage and bravery. The lion holds no fear. Consuming the sun is the alchemy of God's energy. Of quiet peace and love for the soul within you real sunlight is beneficial but the quiet focus on being, your breath, on energy flowering through your body. This is the consumption of the sun. Gods energy. The painting is a representation of a aspirant working towards becoming an adept. Its beautiful, courageous, and a working energy toward God, toward love and for mankind's souls. Its lovely. Thank you for posting it.